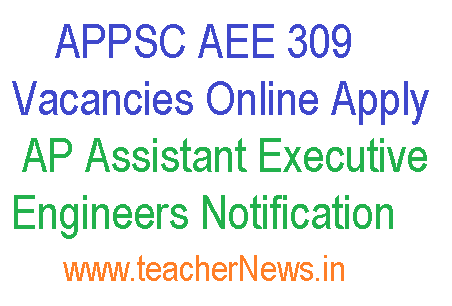 APPSC AEE 309 Vacancies Online Apply – AP Assistant Executive Engineers Notification 2018: APPSC AEE Notification 2018 – Apply Online For 309 Posts, Application Form, Registration @ psc.ap.gov.in.Andhra Pradesh Public Service Commission (APPSC) has advertised a notification for the recruitment of Asst Executive Engineer (AEE) vacancies in various engineering services. Those Candidates who are interested in the vacancy details & completed all eligibility criteria can read the Notification & Apply online.How to Apply for APPSC AEE Assistant Executive Engineers 2019 Recruitment. Good News for Engineering graduates in Andhra Pradesh Andhra Pradesh PSC Assistant Executive Engineer Recruitment 2018 – www.psc.ap.gov.–APPSC AEE 2018 Notification is out. 309 AEE Vacancies in various Departments of Andhra Pradesh Govt APPSC AEE Recruitment 2019 Apply Online, Andra Pradesh PSC Assistant Executive Engineers Notificaion 2018 Exam Patten, Syllabus at psc.ap.gov.in. 04 AEE (Civil) in A.P. Water Resources Department. 05 AEE (Mech) in A.P. Water Resources Department. AEE (Civil / Mech) in A.P Panchayat Raj & RD Engineering Service. 07 AEE (Civil / Mech) in A.P Tribal Welfare Engineering Department. 08 AEE (Civil) in A.P Public Health & Municipal Engineering Department. 03 AEE (Electrical) in Roads & Buildings Engg. Service. Interested and eligible aspirants can apply for AEE posts through online at psc.ap.gov.in. Applicants can initially go through the notification clearly before applying for AEE posts. After that, candidates can apply by filling up the online application, which is accessible on the PSC AP website. Attach the scanned copies of requisite documents along with the application form while applying for the AEE posts. Take a printout of the application acknowledgment after completion of the application process. 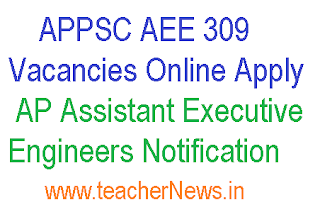 APPSC AEE Notification 2018 Apply Online For 309 Assistant Executive Engineer Posts. How to Apply for APPSC AEE Assistant Executive Engineers 2019 Recruitment.